For Martin Luther King Day, I wanted to put together a broad list of inspiring and important African American movies and shows that often aren’t included on other lists for MLK Day or Black History Month. 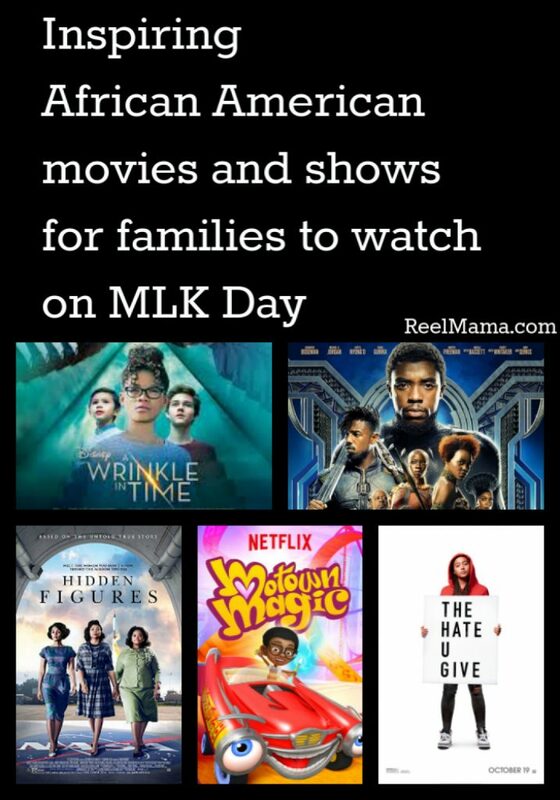 Many other lists of MLK Day movies for families feature documentaries about the man himself, but these movies and shows celebrate African American culture in a variety of ways. MLK Day can be a time not just to reflect on the accomplishments of the man, but to enjoy African American stories that touch on all realms of life, from history and civil rights to music and love, and much more. On a personal note, I am not African American, but my children are multiracial, of Cuban, Chinese and European ancestry. It struck me as I was putting together this list that there really is a remarkable lack of movies and shows starring children of color. It’s important for children of color to be able to see themselves reflected on the big and small screen, so that they can know that their stories and experiences matter. While Hollywood has a long way to go, we are starting to see a greater diversity in casting that gives me a lot of hope. The widespread perception in Hollywood still might be that movies starring young people of color won’t make money, yet we are seeing many successful examples at the box office that disprove that idea. Here are some fantastic African American movies that you can enjoy with kids of all ages. I’ve included over 30 movies, in no particular order, categorized by age for young children, older children, and teens. If I’ve missed any great movies celebrating or exploring African American culture, don’t hesitate to let me know in the comments section! My wonderful readers have also weighed in on this topic, so a second readers’ choice list of African American movies will be coming soon. Motown Magic is a new Netflix series for very young children, and it’s the only animated series that comes to mind featuring a young African American boy. Ben enters a fantasy world, where he paints with a magical brush to help bring bright colors to Motown. While the animation is low budget, the Motown songs woven into the story are a great way to introduce a new generation to some of the greatest music ever recorded by the likes of the Jackson 5 and Stevie Wonder. Smokey Robinson produces. This Disney Junior show is sweet and inspiring, about an African American girl who becomes a doctor to her toys with the help of a magic stethoscope. American Girl movies are sweet and very kid friendly. Melody 1963 tackles civil rights in a way that young kids can start to understand. Interesting bit of trivia: Common executive produced. Polly is a 1989 Wonderful World of Disney production starring Keshia Knight Pulliam and Phylicia Rashad. Through her optimism and with the help of music, Polly unites her segregated community. Another Wonderful World of Disney production, Ruby Bridges stars Chaz Monet in the true-life story of one of the first African American girls to attend an all-white school in the deep South at the tender age of six. Released in 1998. In a reboot of the 1984 story, Jaden Smith plays Dre Parker, who learns the art of kung fu from a maintenance man played by Jackie Chan in order to fight a school bully. Tiana is fighting hard for her dream to open a restaurant in New Orleans, but she gets sidetracked when an enchanted frog prince kisses her and turns her into an amphibian. Tiana was the first (and hopefully not the last) African-American Disney princess. Nella is no ordinary princess: she’s a princess knight! This girl power series for preschoolers on Nickelodeon teaches lessons about fairness and teamwork. A wonderful rated-G short film about Janet Collins, the pioneering ballerina who was one of the first African American prima ballerinas. But it wasn’t easy: she was asked to paint her skin white by the Ballet Russe. This inspiring Civil Rights-era movie is the true story of three female African American scientists who worked at NASA, and the obstacles they faced because of their race. Tracy Turnblad wins a teen dance contest show in the 1960s. With her newfound stardom, she hopes to get African Americans invited to be on the show for the very first time. This movie is a blast, and the music is super fun. Note that there are two versions of this movie: one from 2007 and the first version by John Waters from 1988. Sounder, a rated-G movie, is more than just a story about a boy and his dog. It’s about the struggles a family of sharecroppers face in the Great Depression. Nathan’s father wants him to learn to be a farmer like himself, but Nathan wants nothing more than to go to school, where he’s learned about important African American figures of history. In this recently-released and very unique superhero flick, a young African American teen encounters a radioactive spider. One bite later, young Miles finds that he has become Spider-Man. However, he soon learns that many others in the world possess similar gifts, and now they must all ban together to defeat a supervillain. Director Mira Nair brings us this uplifting story of a young Ugandan girl who strives to lift herself out of poverty by mastering the game of chess. Talk about girl power–I love this movie! An inspiring dramatization of gymnast Gabby Douglas’ rise to become an Olympic champion in 2012. The movie was too early to deal with the tragic Larry Nassar abuse scandal, so for young girls this remains a story of one young girl’s Olympic dream coming true after years of preparation. The Proud Family is a Disney Channel animated show from the early 2000s that features a high school student navigating adventures and misadventures with the help of her close-knit family. Features a star-studded lineup of guests. A moving sports drama set in 1970s Philadelphia about a young man named Jim (Terrence Howard) who renovates an abandoned building and founds an all-black swim team to the consternation of a disapproving city official. A Disney Channel movie about a young rapper who wants to use his skills to impress his dream girl. Unfortunately, his best friend gets to deliver his lyrics to her, in a modern take on Cyrano de Bergerac. Akeelah wants to make it to the National Spelling Bee, but she is reminded that girls from South Central LA don’t achieve such pipe dreams. Akeelah, however, doesn’t give up. The first major Hollywood feature directed by an African-American woman, Ava Duvernay, I didn’t want to overlook A Wrinkle in Time. Duvernay made certain that her movie featured a diverse cast, including the young female lead. In Will Smith’s breakout role, he starred as a “fresh prince” from Philly shaking up the lives of his wealthy aunt and uncle in Bel Air when he comes to live with them. You can catch episodes on BET. This powerful movie from the early 1960s took a thoughtful and daring look at race during the height of the Civil Rights era. Required reading in many schools, the movie To Kill a Mockingbird is just as great. This PG-13 movie stars Will Smith as an unsuccessful salesman who loses his home and his wife. Yet he gets to keep the most important thing in his life: his son, played by real-life son Jaden Smith. As father and son struggle together, they never stop believing that things are going to get better. Moonlight won the Best Picture Oscar in 2017, when famously La La Land was read out as the winner by mistake (the guardian of the envelopes was distracted when tweeting from backstage). That debacle unfairly stole Moonlight’s thunder, but don’t let it keep you from watching this elegiac movie about a black youth coming of age and growing into manhood. Director Barry Jenkins’s follow-up to Moonlight is now playing in theaters. Based on a work by celebrated African American author James Baldwin, the film follows the impact on a young couple in love when the fiancé is falsely accused of committing a crime. Starring the icon of black cinema Syndey Poitier, this classic is really not to be missed. “Liberal” parents portrayed by Spencer Tracy and Katherine Hepburn are forced to examine their values when their daughter brings home her fiancé, who just happens to be black. Get Out is a rather twisted take on Guess Who’s Coming to Dinner. It is disturbing, yet powerful and thought provoking. In a touching true story, a white couple forms an unlikely friendship with an African American homeless man. The experience changes all of their lives. Based on the New York Times bestselling memoir. Black Panther is the first Marvel movie featuring not only a black hero but an ensemble cast. With cinematic excellence, this stylish and powerful superhero film has become one of the top-grossing movies of all time. A couple dreaming of becoming professional basketball players fall in love, but will their dreams get in the way of their romance? One of the most powerful movies of 2018, The Hate U Give is based on the young adult literary bestseller of the same title. A young high school student attempts to fight the system when a cop unjustly kills her best friend. Comedian Chris Rock chronicled his growing-up years in this sitcom from the late 2000s. The funny coming-of-age show is one of the few sitcoms over the years that stars a young African American boy. You can catch episodes on MTV2. Hi, Lauren. I’ve seen or heard of a few of these, they are great programs. This is a good list. Thank you for sharing. I’m so glad you enjoyed the list, Cynthia! Let me know which are your favorites.